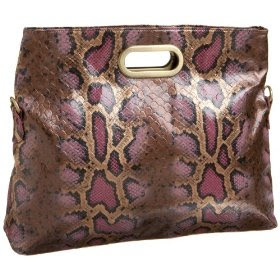 I found myself in love with a pink, purple and gold faux snake skin bag by Big Buddha. When I found a Big Buddha bag in TjMaxx this past March I scooped it up and carried it all spring and through the summer. I loved it so very much - and many others did as well. But still, I find myself seeking cheaper alternatives, like this oversized clutch from fredflare, or this larger bag by Vani on ebay - both under $30.